Located on Copenhagen’s waterfront, this hotel puts you in the center of the city’s most popular attractions. Copenhagen Mariott is just a short walk away from Stroget shopping center and offers bike rentals for exploring nearby destinations. 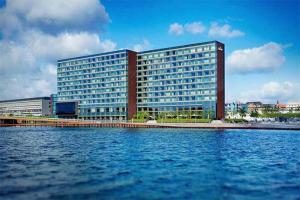 The hotel features 406 rooms that are among the largest in Copenhagen and offer views of the harbor canal or old city. Guests can enjoy a meal at the Midtown Grill or workout in the 24 hour fitness center. Located in the heart of Copenhagen, right on the waterfront. Just a 14-minute drive from the Copenhagen Airport.